Top Wooden Toys for Kids – Great for Gifts! I love wooden toys. I love that they don’t have a bunch of noisy components and that they can inspire imaginative play. My kids love them too, so I’ve compiled a list of the top wooden toys for kids that are great for gifts! Ready to Shop? 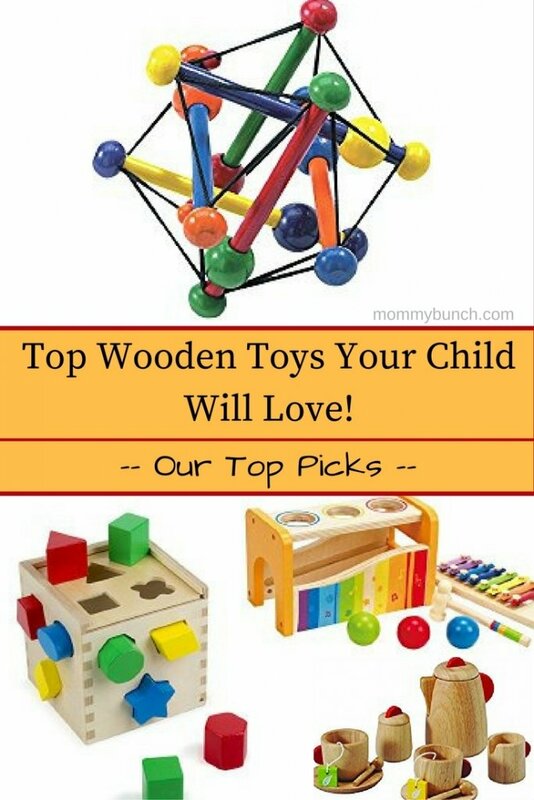 ==> CLICK HERE to shop top Wooden Toys on Amazon! Melissa & Doug sorting cube – A shape sorter is always a fun toy. My 1yr old boy can sit and try to figure out how to get those silly shapes inside the box for quite some time. It also makes a great learning experience for him as I can say the colors or shapes as he picks them up. Melissa & Doug fruit cutting set – Have your kids ever wanted to help in the kitchen? Mine want to all the time! Now they can work along side you cutting up fruit without the risk of using a real knife (until a bit older that is). This toy teaches hand/eye coordination and motor skills, and is great for introducing concepts of whole and part. Haba Magica clutching toy – I absolutely love these because my son and daughter could just sit move them around and around for ages. They are easy to grasp for young children and it is considered a teething toy for babies aged 6 months and up. Melissa & Doug take along tool kit – Boys and girls alike will love this tool kit with working parts! You can really thread the screws and pound on the nails. This is a great way to keep the kids engaged in an activity and using their imagination for quite some time! Hape pound and tap bench with xylophone – I’m so in love with this toy, and so are my kids! My 1yr old son absolutely loves balls, and he loves sticking them in things. This is the perfect way for him to be able to do that, plus he gets rewarded with a fun noise when the xylophone is placed inside as a ball catcher. Manhattan Toy skwish classic rattle & teether toy – This teether was a Best Toy Winner last year, but it is still good enough to make it on our list of top wooden toys for kids! Not only is this a fun teether for babies, kids with sensory issues like to squeeze and squish as well. My older son likes to always have something in his hand to play with when he is reading or working on homework, and this works out great! Melissa & Doug 50 piece ABC block set – A classic, and the #1 Best Seller on Amazon, this block set is a colorful collection of pictures, letters, and numbers. Kids love stacking and knocking them over, and they are great for word recognition, matching, sorting, and more! Melissa & Doug car carrier – When you have a kid who loves to make things go “vroom”, a car carrier is a fun way to let their imagination soar! This wooden playset can carry cars (which are compatible with all standard wooden train tracks). A great way to encourage motor skills and imaginative play. Everearth Jr. size ramp race – I have never seen my 1yr old son giggle as much as he does when he sends something down a ramp. Just the thrill of watching something roll and roll is fun and exciting! This Jr. Size Ramp Race is perfect for him to do just that – and you can send balls down it too if the cars become too mundane. (A great thing about EverEarth is that they also plant one tree for every toy they sell). Plan Toy solid wood tea set – We gave the girls a real tea set once. Don’t make my mistake. Go for the wooden one and save yourself the hassle of cleaning up broken glass shards everywhere! This cute set also comes with cute ‘tea bags’ made out of wooden pieces. This toy encourages imagination and healthy social interaction. Do you have any favorite top wooden toys for kids? Pro Tip: Sign up for a Free Trial of Amazon Prime to save on shipping costs! Just CLICK HERE. Don’t forget, Amazon prices change often so be sure to check final price in the cart before purchase. Check out our other Kids Toy Reviews HERE! PreviousPaw Patrol Christmas Gifts Your Child Will Love – Our Top Picks! NextGet the Newest Paw Patrol Kids’ Movies – Pups Save Christmas! How adding small touches each year can beautify your yard in no time! Packaways -More than a box, a storage solution!